We took a trip before school started. It was part trip to see family, part vacation. It felt really good to pack bags, get in the car, and go away all together. First we went to see family in Montreal. While we were there Fayez lost a beloved family member to cancer, and it was hard. When we arrived her hospital room was full of children, in-laws, grandchildren, and extended family. There was so much love there for her, so much love that she left behind. Her legacy was her faith and her ability to freely love and accept so many people. For her, family was everything. I have a lump in my throat writing this, because she certainly made me feel loved and accepted. She didn’t have to. She didn’t have to take me in and insist I call her Grandma, but she did. She made an incredibly huge impact on me, and I’ll always be grateful. It was hard to say goodbye to such a loving and wonderful woman. I’ve had several southern friends ask me about Canada. To the south, Canada is a far away and bizarre place where everything is supposedly covered in ice, the word “aye” gets thrown around constantly, and nothing makes sense. The phrase “they’re from Canada” is an all encompassing explanation. Person One: Why do they do that? Person Two: They’re from Canada. But here’s what I can tell you about Montreal (since it’s the only place I’ve been). 1. 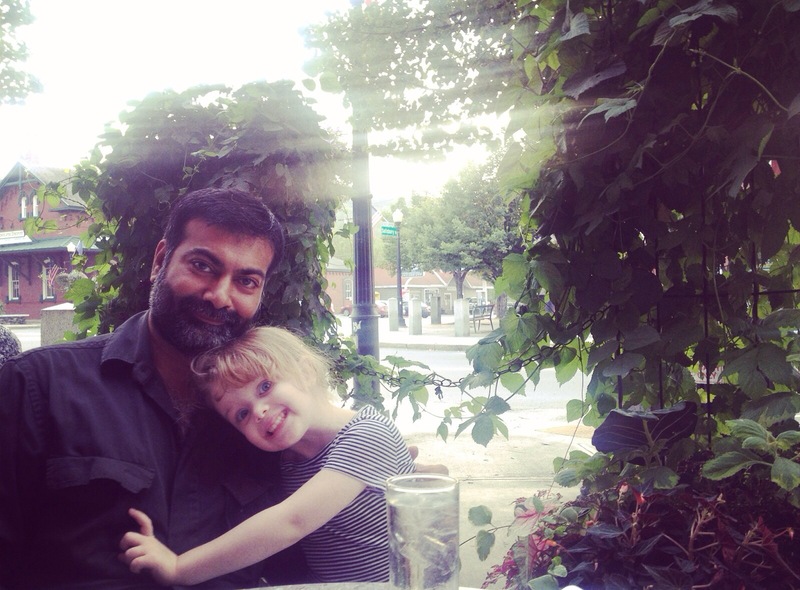 The people in Montreal, in general, are hugely nice and polite. I suspect this has a lot to do with the personal satisfaction of successfully speaking two languages and also…maple syrup. That stuff is like crack. 2. Women who have babies typically take off anywhere from six months to a year. Like, their jobs are protected and they’re paid a fraction of their salaries. I mean, this alone makes me stand up and applaud Canada. COME ON UNITED STATES. We can do so much better for our moms. 3. There are so many beautiful parts of the city. Downtown Montreal feels like visiting Europe. Everything is hugely family friendly. The streets are really clean. The suburbs have seriously beautiful flower lawns. 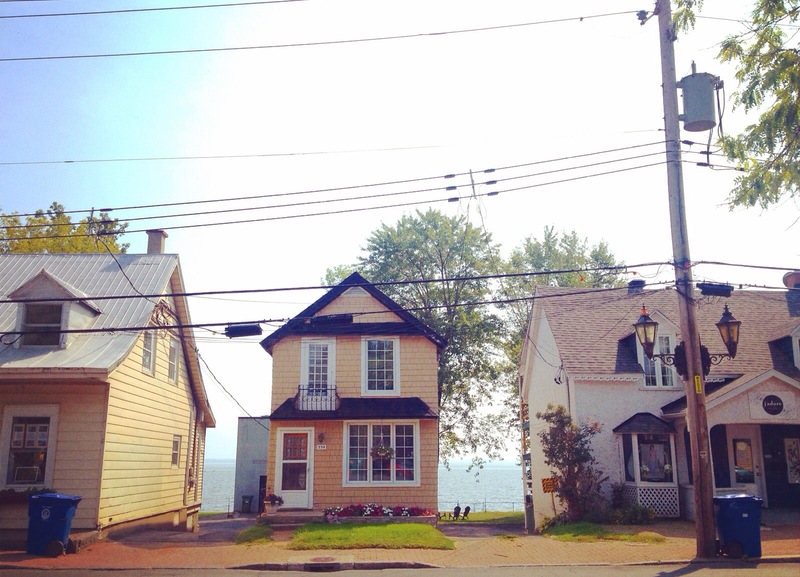 On the last day we lunched with Fayez’s aunt in a beautiful little community called Point Claire, which was basically like this tiny lake front community with old farmhouse right on the middle of Montreal. So many sighs for that place. So my verdict on Canada is pretty awesome. Although, just hearing about winter makes my thin blood ice over. Snow in April or May is my Achilles heel. From Montreal we drove south through Vermont. The day became evening and I became a very hangry version of myself. I usually keep a bag of peanuts or a snack in my purse, but as we drove through the Green Mountains and the light grew dim, I knew that a handful of peanuts wasn’t going to cut it. It was becoming “hamburger or nothing” time. We took an impromptu detour off the highway into a small town, Randolph. And you guys. I fell in love. It was like something from my best Gilmore Girl fantasy. Rolling mountains, church steeples, Victorian houses, main street with quaint hardware stores, ice cream shops, train station, coffee shop… my brain nearly exploded. We ate at a wonderful little restaurant on Main street, out on a patio with twinkle lights and I seriously considered never leaving. But then we discussed the possibility of not having jobs and homelessness, so back in the car we went. But Randolph seriously still has a piece of my heart. From there we drove down to Salem. Anyone who knows me at all knows this has been on my bucket list since I was old enough to hide in a closet and yell boo (which has happened more times than you would think). When Fayez and I first met, I told him how much I had always wanted to go there. Some people are a little grander with their have-to-visit bucket lists, but Salem has always been on the top of mine. Over a year later after telling him, he remembered and planned this trip. Salem is what you would expect. It’s picturesque, ocean-side, historic, slightly creepy. I have to say the little witch shops let me down just a smidgen. Bags of glitter as potions? Um. No. As Jane says, “You’re just kidding me.” But I forgave them because they had old wallpaper, and purple stairs, and window boxes. Not the place to go (not that it was my goal or anything). Bingo. I can only imagine this place around Halloween. We toured The Witch House, the last standing structure directly connected with the Salem Witch trials. Historically it was very cool to walk through a 300 year old house on a self guided tour. We got to inspect things at our own pace. 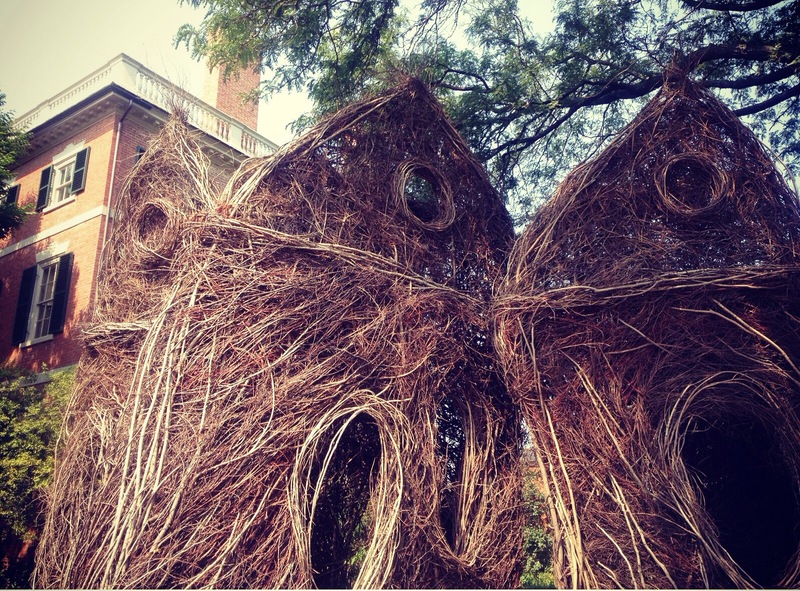 Near the center of the historic district an artist constructed these giant creepy twig houses. Jane and Fayez had a blast running around in them. I had a hard time being charmed because… True Detective Season 1 ruined all things twig-constructed for me. AmIRight? I like to call this the “I Smell Children” photo. 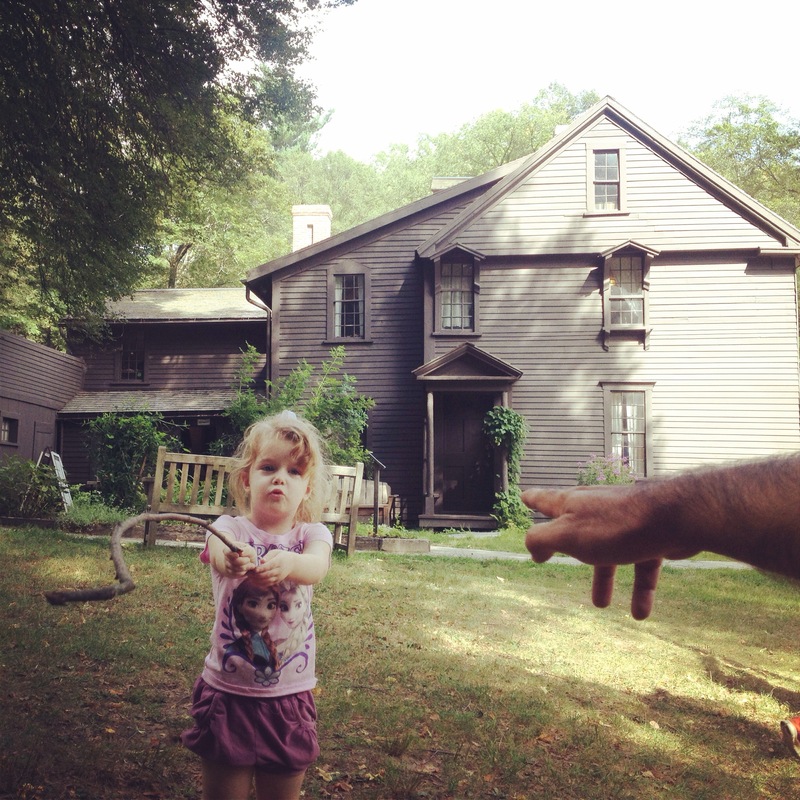 Jane declared the Witch House was the “Hocus Pocus” house and kept asking if the witches lived there. 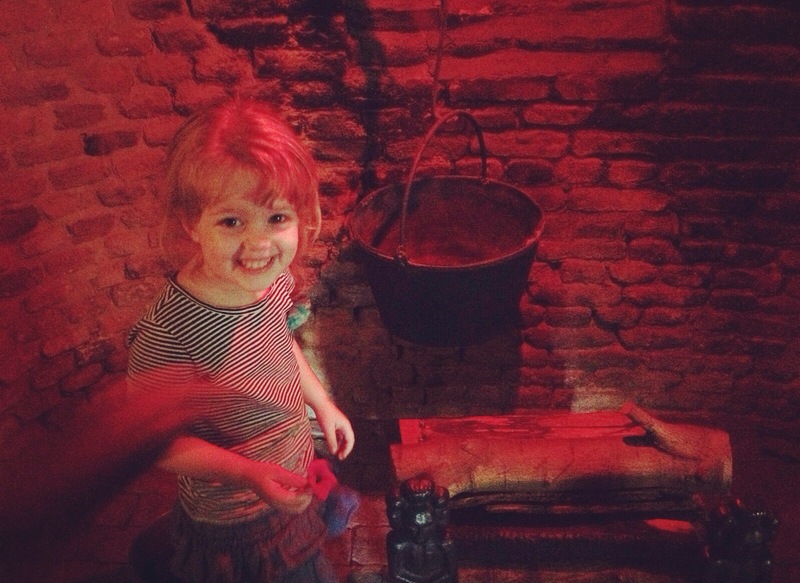 She ran over to the fireplace jumping up and down and found a broom in the corner that thrilled her heart. But in the end she figured out the witches would not be coming to meet us and got a little bit hacked. Out of all the tours I felt like this one was the most authentic glimpse into what it was like to live in New England 300 years ago. If you were rich. Which we can all agree would be preferable. 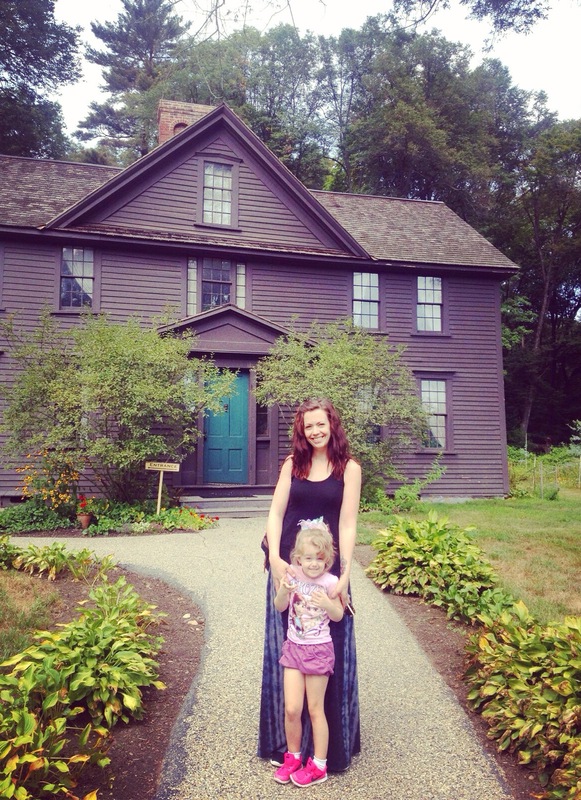 New England and its history are foreign to this born and raised southerner. 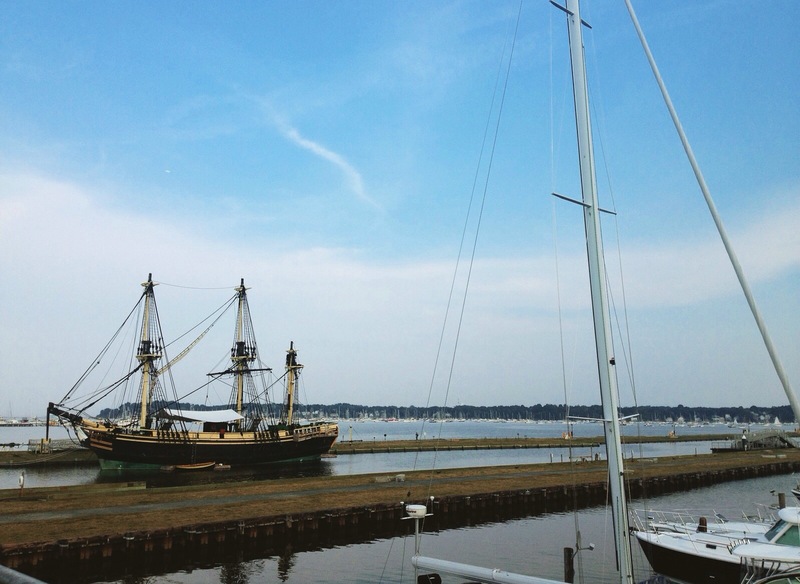 Up here it’s all founding history and ship captains and the Revolutionary War. Down south it’s all gingerbread and front porches and the Civil War and plantations and cornbread and ya’ll. Okay that particular paragraph had no point and really isn’t going anywhere, but it somehow felt relevant. We also visited The House of Seven Gables, which at roughly $10 per person was the most expensive tour, but hands down worth it. The grounds themselves overlook the water and as you can see, it’s really beautiful. The tour itself also includes a hidden staircase inside the fireplace, and the attic where the servants live. It was pretty darn Pottertastic. 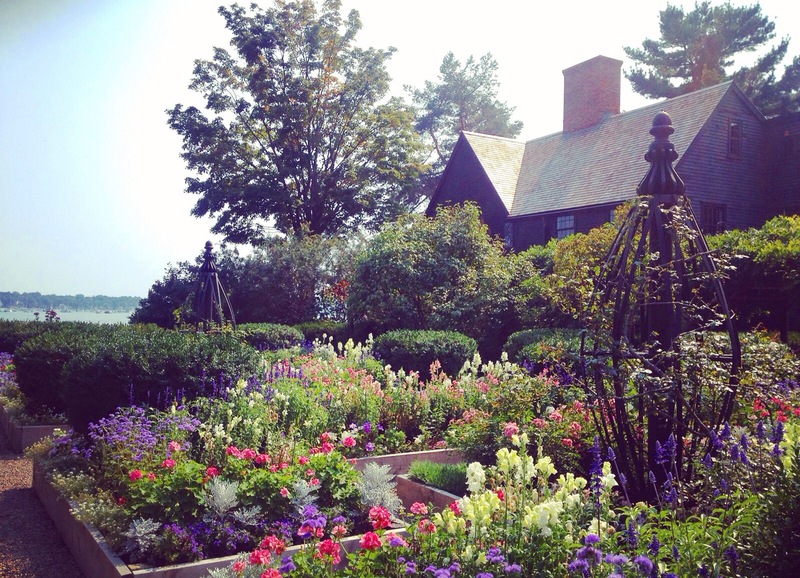 Additionally, Nathaniel Hawthorne’s birthplace is also on the property and you can self-tour that as well. It’s red and cheerful and I could have moved right in. I’ve been pretty honest about how hard it’s been moving to New York. It’s SO much better now, six weeks later, and I’m really enjoying living in the city. But this trip into New England was really cathartic for me. I fell in love with this area, and despite being a non-Yankee, I could not be happier about living in this part of the country. Fayez is… in a word… a patient man. This photo is my ultimate piece of evidence. 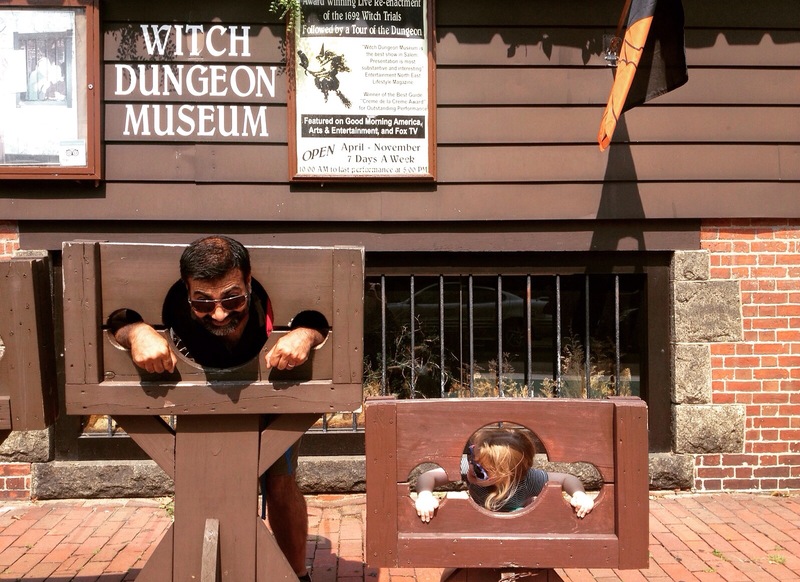 As long as he got a periodic supply of coffee from Dunkin’ Donuts he was A-Okay, even when it came to picture posing with Jane in the stocks. Oh who am I kidding, he loved it. The next day we drove to nearby Concord where we visited Orchard House. This place is basically Mecca for literary geeks, and I was beyond stoked. But you’ll be glad to know I did not yell that, although Fayez may have mumbled it under his breath, which made me laugh and distracted me from feeling like I was going faint. But it was seriously hot in there. If you tour in the summer/hot months, bring one of those little clip on fans and something to spritz your face. Or spritz people who delay the tour with totally off topic stories about their grandmothers. But overall it was still worth it and I’m glad I got to go. The house is full of the family’s original possessions, artwork, and furniture. Louisa’s writing desk is still there, along with her adorable built in book shelf in her room, and her mother’s kelly green china set is almost worth the felony charge that would accompany attempting to steal it. Almost. But not quite. We sat outside after the tour under a giant oak tree. It was so peaceful. These are always my favorite parts of traveling. Not necessarily the big giant tours or sites, but the little moments that happen on their own. Jane reenacted Dalek battles with Fayez. There’s a tiny part of my heart that expands double the size every time they shoot at each other with imaginary stick laser guns along with “toof toof” sound effects. 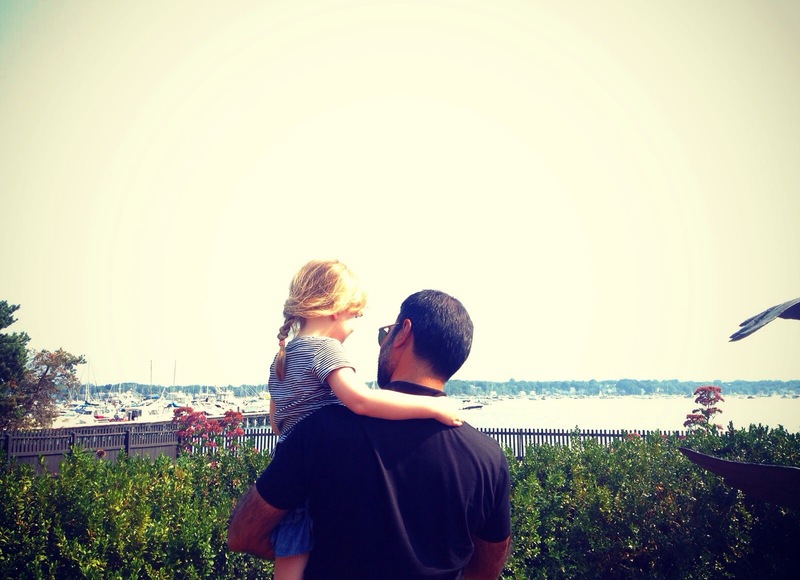 Then we took Jane for her first ocean visit at Marblehead. She flipped. We knew she would be excited, but we did not know she would run and scream like a crazy sea-imp banshee. She ran into the waves, got completely soaked, and cried like a baby when the sun started going down and the winds got cold. She’s just such an enthusiastic traveler. With the exception of asking Fayez to carry her everywhere, she was a total champ. 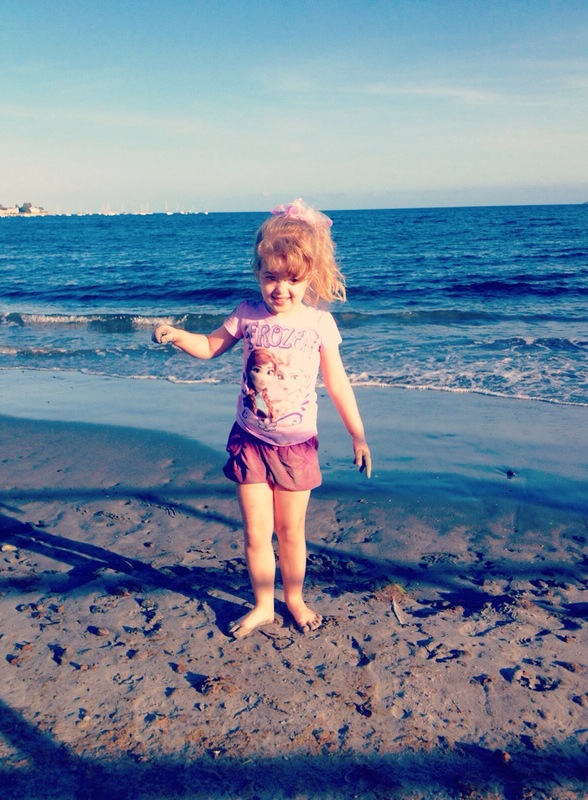 But watching her lose her mind over the beach and the ocean was the highlight for all of us. After leaving the Boston area we stayed with friends at their house in Vermont. I’m thankful we have friends willing to let us invade. Because let’s face it, when you go places with kids, you’re not just spending the night. You’re invading. In the end, Vermont totally stole my heart. The mountains are luscious. There are great antique stores. The woods smell like tarragon. The entire state is like my mother ship. Jane and Fayez swam in a spring fed lake, and I sat on the shore using my iPhone zoom in on the houses like the creeper I am. The concept of summer houses totally befuddles and fascinates me at the same time. And then, just like that, it was time to go home. We drove several hours and crossed over the George Washington bridge. I watched the massive skyline get closer and closer and thought, “I can do this. I can live here.” And you know what? Ever since then, every single day has been better and better. I think this vacation was partly responsible for that. 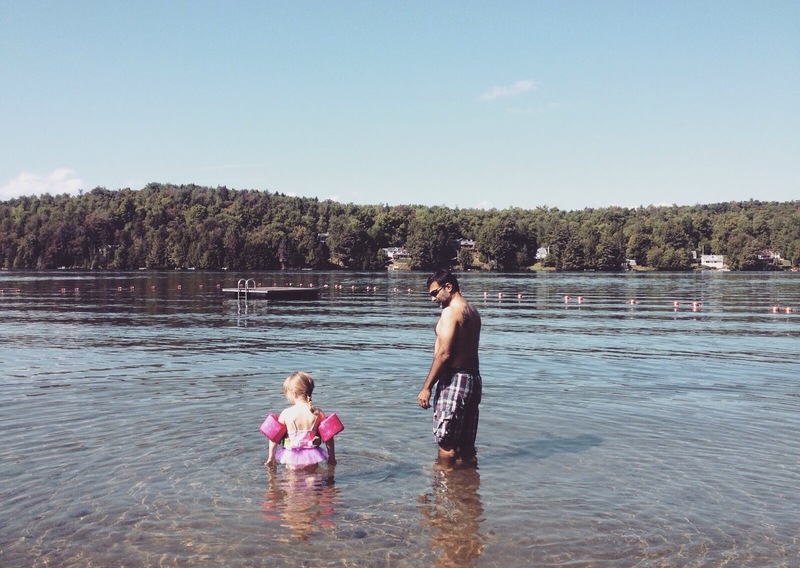 It gave me some really wonderful time with my new husband and daughter, it was a much needed mental reboot, and some once-in-a-lifetime adventures. So there you have it. That was our vacation. It was the best vacation I’ve ever had, hands down. And now… it’s fall. This week. I can’t believe it. Mama Tried. And Not Fitting. Welcome to Vermont, Liz! I’m so glad you enjoyed your time here, and throughout New England (and Montreal!). It truly is a special place. I’ve lived here most of my life, and will be moving to Arizona in May. I will miss most parts of it, although having winter from October to May–not so much. I’ve been a follower of yours for quite a while (so happy that YOUR happy😀). If you would like to see lots of pics of this area, I just started an Instagram account @abitofeastandwest. Happy Fall from Vermont! I live in Iowa, and while I love it here with all my heart, when I went to Vermont for a work trip with some extended days to wander off on my own all I could think is “Vermont is my people”. I wanted to stay forever. I feel you. I almost squealed reading about your wonderful trip and life re-boot; we all need one of those every now and then. So happy for you and your little family. Thank you for sharing! What a wonderful time you all had! 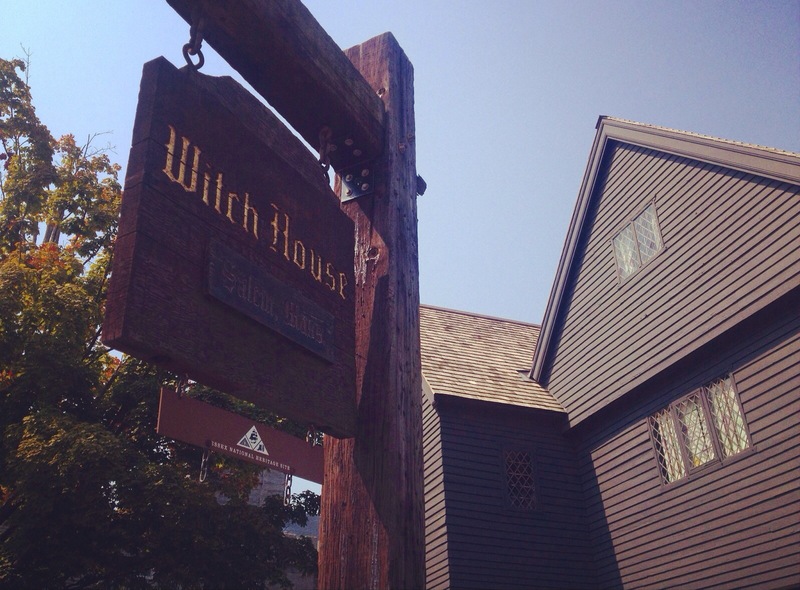 Some you/me connections in your visit: I have a daughter who lives in NYC (like you), a daughter who lives in Boston (where you visited), a dear friend who lives in Marble Head (he’s a minister there), and I’m the descendant of a gal who was tried for being a witch in Salem–TWICE!–and got off each time! Liz, you look truly happy and content. As a long-time reader, I cannot tell how delighted that makes me feel. You deserve this so much and I am just thrilled that it’s come to pass. 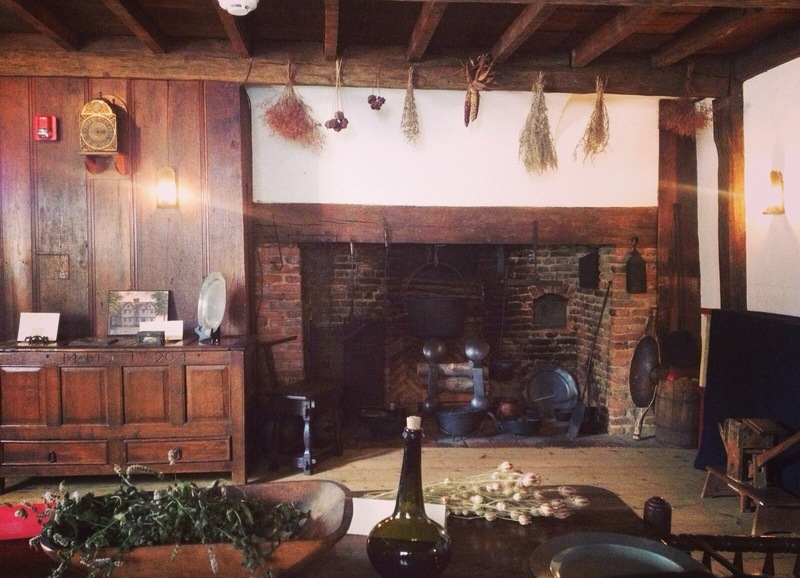 I am jealous (completely and madly) that you visited Orchard House and Salem. *sigh* They’re on my bucket list, too. As a Canadian, you must visit the Niagara region in Ontario. Niagara Falls, cheesy midway rides and games, The Ripley’s Believe it or Not museum. Wineries. Lots of ’em. What a wonderful trip! I would love to go to all of those places. Once or twice in a lifetime, you end up in a place to which your soul has been calling you, and you didn’t even know it until you arrived there. Isn’t that a wonderful feeling? 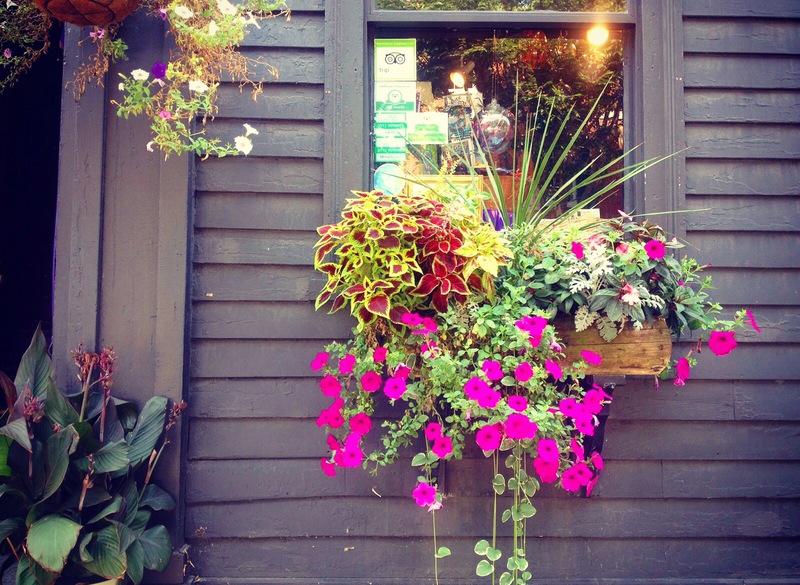 New England is enchanting. As a born and bred Bostonian, I am glad you enjoyed your trip to New England! I hope our accents were not too jarring! 🙂 I count myself lucky to live by the water and loved to see Jane’s reaction to the beach. Thank you for sharing your adventure! 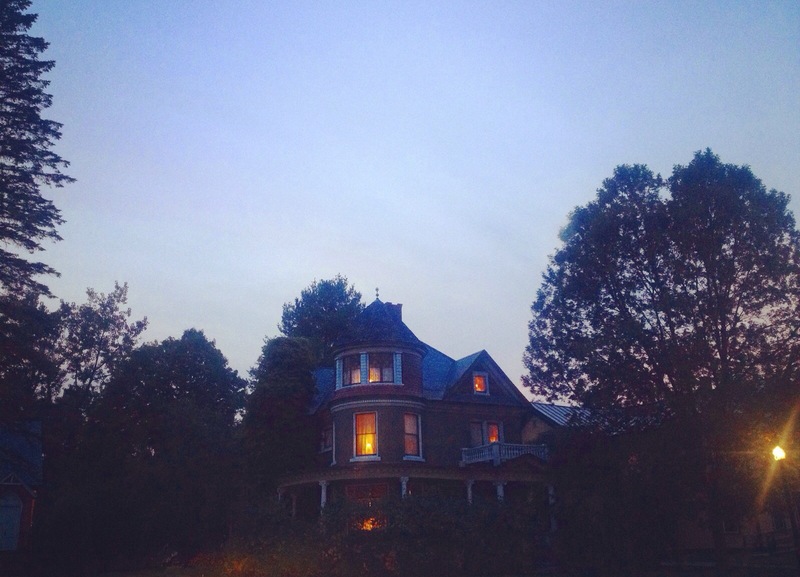 PS Did you get to one of my favorite destinations in Vermont (great state), Ben & Jerrry’s? Loved this. I’m a little envious you’ve already seen so much of New England already, as I’ve lived in the Hudson Valley for ten years and still have not been to much of Massachusetts other than Boston (which is a favorite!). Someone above mentioned Niagara Falls which is amazing. Should you go don’t miss Niagara-on-the-Lake. It looks like an English village, great shops and dining and a terrific theater festival every summer. Try to check out the Great Jack O’Lantern Blaze in Sleepy Hollow- Jane will love it. 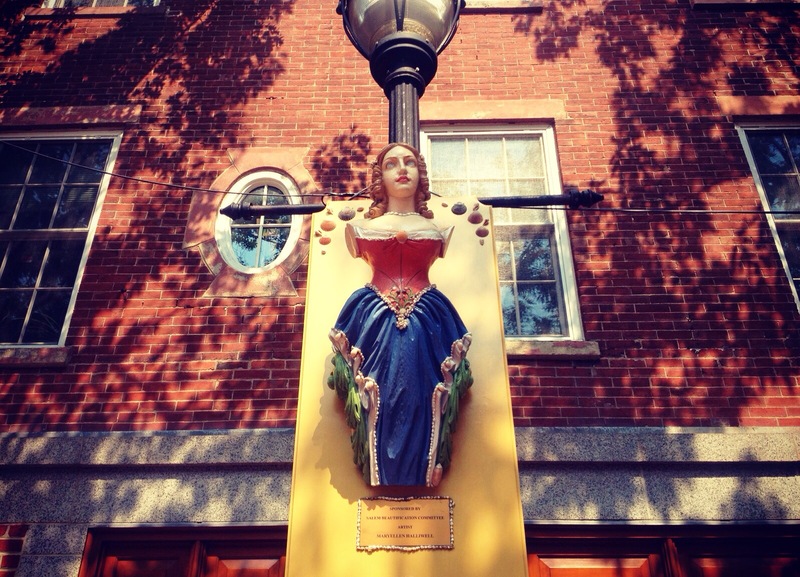 I was born and raised in Massachusetts–my family has lived in New England since before the French and Indian War. I’ve traveled quite a bit and I’ve found beauty in many places to the point where I’ve played with the idea of moving away from New England, but in my heart I know I could never leave. I’m so glad that, having left the place where you were raised, you have found happiness in the New York and New England regions. PS In early Spring head back to Vermont and take Jane on a maple sugaring tour! Aww, one of my oldest friends and I did a similar trip (minus Canada) about 8 years ago. I loved reliving it in your pics. Love the garden shots especially. And how big is Jane!? This should not surprise me as our girls are close in age and we actually have that exact same Frozen shirt. 🙂 I’m enjoying this new part of your life. Glad you are, too. We get a year of unemployment insurance from the government in Canada, but lots of women can’t afford to live on that and go back sooner. Let me tell you: a whole year with your baby without worrying about whether you have a job to go back to is the greatest gift. What a dreamy getaway! 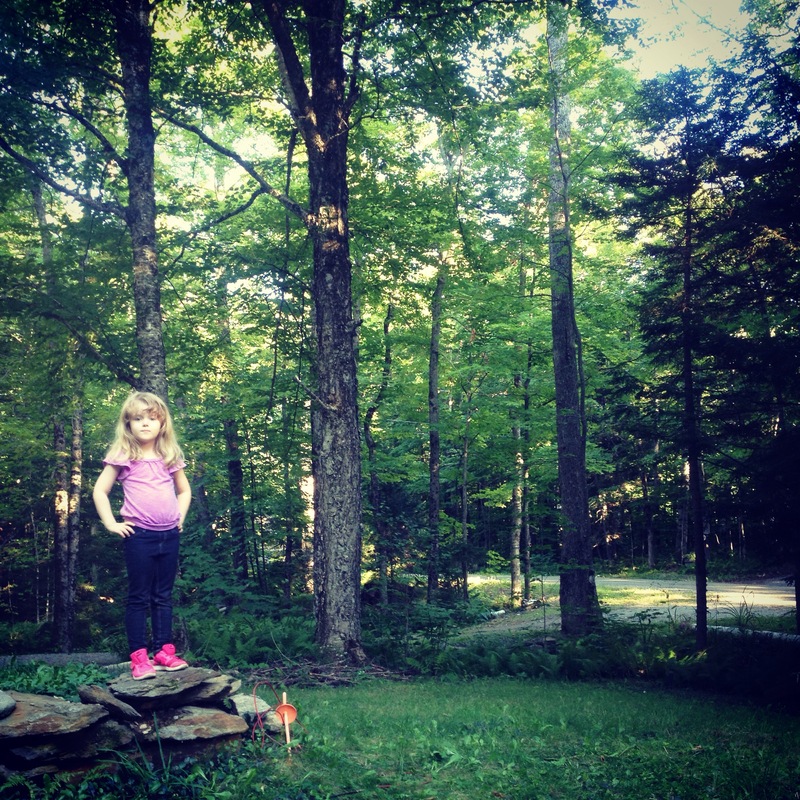 I’m so happy you’re blogging your grand adventures! Thanks for sharing. I’ve read your blog for a long time, but haven’t commented in awhile. I had to respond to this post, though, and say that my heart did a little leap to see you were in Vermont and loved it! It’s neat to have someone I’ve followed online for years visit so near where I live and grew up. I just wish I could have told you in that hamburger-hungry moment that driving a little further off the interstate than Randolph to South Royalton for Worthy Burger is the way to go! I hope you get to take more amazing trips like this around New England. I’m sure Vermont will continue to capture your heart. Fall here is like magic!